Quico says: Yesterday I posted on the underlying issue at stake in this election: a tricolor Venezuela, or a monochrome red one? Two different futures. While red Venezuela has found its perfect voice in Chavez, yellow Venezuela, the one that demands spoils now and measures its status by spoils obtained, eats away away at the revolution, and blue Venezuela barely hangs on. The tragic thing is that only blue Venezuela can ultimately offer real solutions to the very serious problems our country has. I think these are themes that come through nicely in this remarkable piece in Slate. CARACAS, Venezuela—It’s Friday night, and Detective Bultron Angel of the Chacao police is playing God. 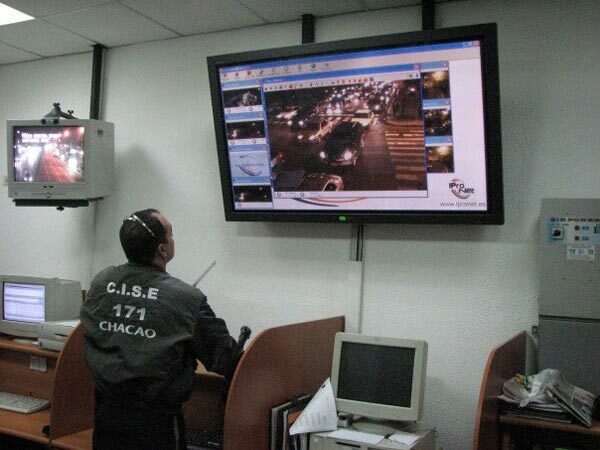 With 22 cameras placed in strategic locations throughout his district, Angel is capable of monitoring the human traffic of some of Venezuela’s wealthiest neighborhoods. Any emergency call to PoliChacao must first pass through his dispatch center, where one of six police officers immediately traces the incoming phone number, running it through a computerized map of the district detailed enough to contain the names of every apartment building and every apartment owner. On the other side of the city, Inspector José Bonaldi of the Libertador Police sits behind his desk in the barely furnished Office of Citizen Security. According to the United Nations, Venezuela recently passed Brazil to claim the dubious honor of having the highest rate of gun-related violence in the world among nations not at war. Much of that crime takes place in the steep and densely packed barrios that decorate the city’s rolling hills, more than a few of which fall under Bonaldi’s jurisdiction. Lost in the media coverage of Venezuelan oil and Hugo Chávez’s colorful antics is the fact that over the last decade, Caracas has become a very dangerous place to live. Colombia might have the history, and Brazil might make splashier headlines, but Venezuela has quietly eclipsed both its neighbors in levels of violent street crime. Unlike Colombia’s narco-guerrillas or the heavily armed gangs in the favelas of Rio and São Paulo, crime in Caracas is indiscriminate; it has more to do with anarchy and the failure of infrastructure than it does organized, armed groups challenging the government’s monopoly on the use of force. Read the whole thing. Which set of cops would you rather have patrol your neighborhood?